L-Tron | What is National Get to Know your Customers Day? What is National Get to Know Your Customers Day? 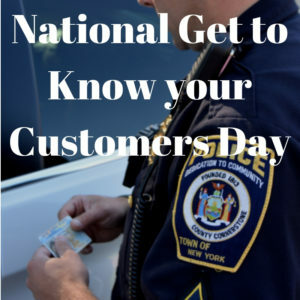 What is National Get to Know Your Customers Day? How is L-Tron participating? National get to know your customers day is a national ‘holiday’ that encourages businesses to reach out to their customers and get to know them on a more personal level. The day occurs annually on the third Thursday of each quarter. For 2019, these dates will include January 17th, April 18th, July 19th and October 18th. Getting to know your customers (and engaging with them) is the key to keep them coming back. According to main street hub, “68% of customers will stop frequenting a business if they don’t feel they’re appreciated” (Main Street Hub). L-Tron prides itself on personalized customer service – with our tagline being “your success is our purpose.” We want to do everything in our power to make our customers happy and successful. Our products and solutions are built directly from the voice of the customer. For this year’s customer appreciation day, we are reaching out to several users of our OSCR360 Solution to request feedback (and testimonials). We will be incorporating customer’s wishlists of features into the next release of the OSCR software, as well as offering a rugged tablet upgrade to various departments. Look for shout-outs to several of our Law Enforcement customers on social media. Thank you for your continued business and for working with L-Tron to create the best products, specific to your needs. What are some ways you can connect with your customers? Ask for feedback and ways you can improve. Engage with your customers on social media. Manage any and all customers reviews – and address any issues as soon as possible. Be authentic and have a company culture that is transparent. Keep your customers in the loop – the more you can communicate with them the better. Be responsive and available to your customers when they need you. Create a community for your customers. Hold customer appreciation events, online training(s), FAQ sessions and anything else that will keep them engaged and involved with your company. Questions? Interested in learning more about National Get to Know your Customers Day?